Impaired Mobility: Decreased range of motion of the joint occurs, of ten with inability to straighten the arm. Popping Sound: A cracking or popping sound, also referred to as crepitus, can of ten be heard or felt at the time of the fracture. When you visit the clinic with a fracture in your scapula, your doctor will review your medical history and perform a thorough physical examination. Diagnostic studies may include X-rays, CT scan and MRI. Most scapular fractures are not significantly displaced due to the strong supporting sof t tissue structures surrounding it. Therefore, a majority of scapular fractures are treated conservatively and with early motion to reduce the risk of stiffness and will usually heal without affecting shoulder movement. 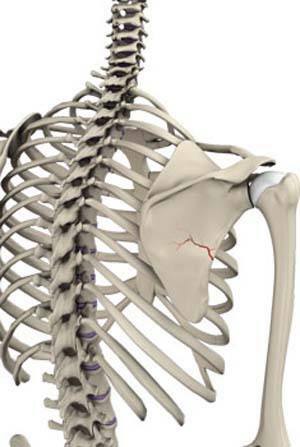 Fractures of the scapula involving the neck or glenoid or with severe displacement have been associated with poor outcomes when treated non-operatively and will usually require surgical intervention to realign the bones properly and restore a functional, pain free range of motion to the shoulder joint.